Amazon recently announced its first drone delivery to a customer in Cambridge, England, with a package delivered to the customer an impressive 13 minutes after ordering. Jeff Bezos, Amazon’s CEO originally announced the drone plan in a 60 Minutes interview on December 1, 2013. 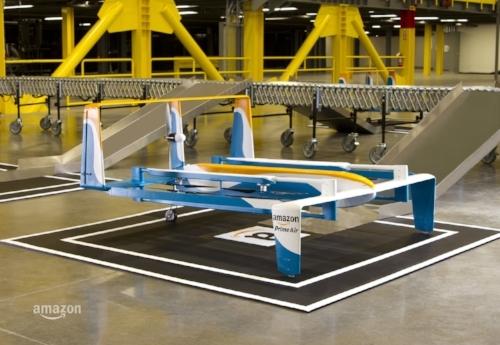 The weight limit on the packages handled by drone is 5 pounds, currently representing 86% of Amazon’s deliveries. Automating the critical last-mile delivery logistics for parcel delivery is a vital part of Amazon’s ambitions to build a full-scale shipping and logistics network, competing with industry stalwarts FedEx and UPS. In addition to its drone delivery patent filings, it has recently has filed patents for flying warehouses, which clearly shows their ambitions on the parcel delivery front. Clearly the company is strong on innovation, as the company has successfully transitioned from its original business of delivering books to become the benchmark online retailer, while successfully diversifying into cloud computing, online content delivery, and consumer devices. This recent accomplishment clearly signals their ambitions to take on the logistics industry as well.